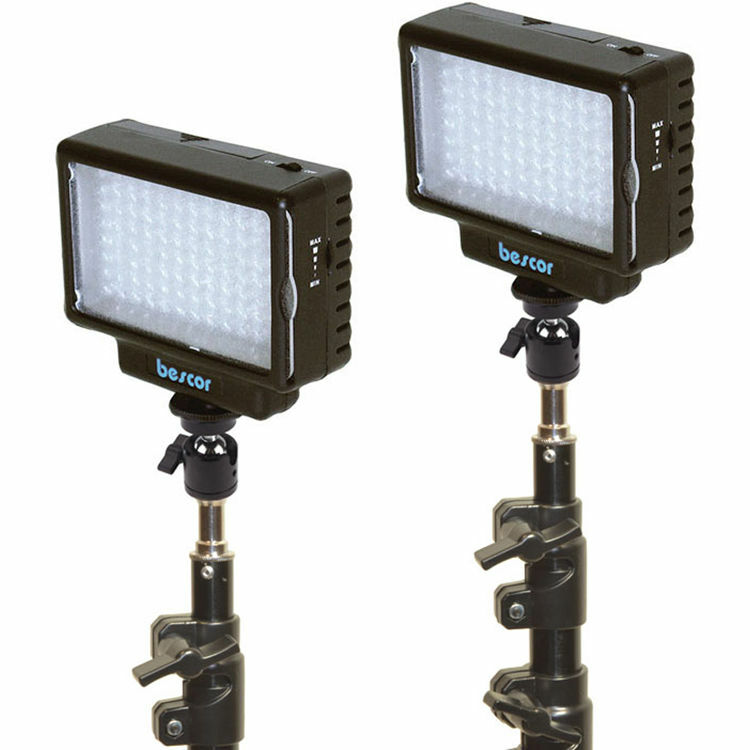 With its 70W tungsten equivalent output, the LED-70 Daylight Studio 2 Light Kit from Bescor is great way for videographers on the go to light interviews, events, or spot news. The kit includes 2 LED-70 Daylight fixtures, conversion and diffusion filters, 2 multi-voltage AC adapters, and 2 light stands. The Bescor LED-70 Daylight fixture is a 6500K on-camera LED light designed to combine bright output with a compact, highly flexible form factor. Powered by six rechargeable or standard alkaline AA batteries or the included AC power adapter, the unit's 96 LEDs produce a bright, 70W tungsten equivalent beam that's dimmable from 100 - 20%. LED-70 Daylight Studio 2-Light Kit is rated 3.9 out of 5 by 7. Rated 5 out of 5 by Kelcor from Does what it says it does... I own an Entertainment Company and we needed lights for a Step & Repeat. Used them this past weekend and they worked great. Gave us just the right amount of light. Rated 5 out of 5 by Kix from Great Light for the price I needed a continuous light for my photo booth and this product worked perfectly. Rated 2 out of 5 by Patrick from I guess you get what you pay for Build quality is uninspiring but may be adequate. I bought these on a flash sale to use for interior video of a yacht for sale. Out of the box they worked fine on the a/c adapter but there is no indication on the unit which way to insert the 4 AA cells - so I checked on the Bescor site. Inserted the batteries as shown - no luck. So called Bescor and was told that if I was having the same problem with two units it was almost certainly user error. Verbal instructions were the same as online - still no luck. So it was suggested I reverse all the batteries. Bingo, success! No apologies just I guess they switched it without telling us. Does not inspire confidence - these are going back and I have ordered Dracast instead. Rated 5 out of 5 by Anonymous from great product complete kit to set up a small studio. the best I could find for this price. i purchased two sets to have four lights around a lightbox and this performs wonderfully. the stands are sturdy. the lights are cool (not hot) and the AA battery capability is great for field work. Rated 1 out of 5 by PERKO from LED-70 Daylight Studio 2 Light Kit The chinese made A/C adaptor did not work rendering one of the lights inoperative - ming data ac adapter to be precise. Rated 5 out of 5 by Miguel R. from Great quality Great quality. Use it with battery and lasted over 8 hours. Shipped immediately.